After conducting an extensive location search and soliciting public feedback, TriMet is proposing building an off-street bus layover facility on northeast Lombard Street near 6th Avenue. On Wednesday, July 9, TriMet General Manager Neil McFarlane brought the proposal before the TriMet Board of Directors. 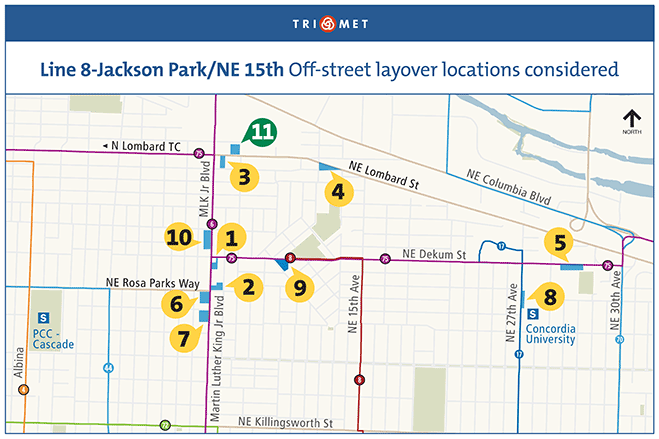 TriMet has scrutinized nearly a dozen sites since spring 2013, looking for a suitable location for an off-street layover facility in northeast Portland, particularly for the Line 8-Jackson Park/NE 15th Ave. The project team has recommended the purchase of the property located at 511 NE Lombard Street, that has been referred to during the site search as “site 11”. If the proposal moves forward, the site will be purchased and a permanent layover facility will be constructed that will include off-street parking for buses as well as a break area and restroom for our Line 8 operators. The total amount budgeted for the project is $2.2 million. The Line 8 is one of our busiest bus lines, providing about 6,000 trips each weekday. Line 8 buses would arrive and depart the layover location from approximately 5 a.m. to 2 a.m. Monday through Friday, 5:30 a.m. to 2 a.m. Saturdays, and 6 a.m. to 1 a.m. on Sundays. During peak service times, buses may come and go up to every 8 minutes. Other bus lines may use the facility as well. Line 8 buses currently layover on the street at two sites, one in the Woodlawn neighborhood and the other in the Piedmont neighborhood. Creating a permanent location for operator layovers could improve on time performance and service reliability for our riders, as well as create easier transfers between the Line 8 and Line 6. It will also provide a safe, comfortable and convenient place for our operators to take their breaks. Changes to the Line 8 made in September 2012 led to buses laying over at Northeast Dekum and Durham. After concerns were raised by the neighborhood, TriMet moved the layover location, and has continued to work with residents, businesses and the Woodlawn Neighborhood Association to lessen the impact of the changes. In spring of 2013, we were able to move bus layovers to alternate temporary locations, while working on a permanent solution.